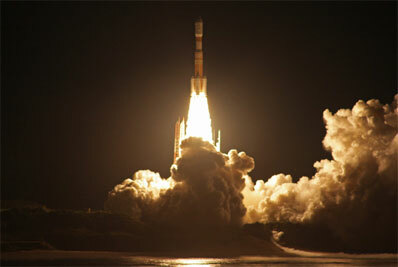 Japan's H-II Transfer Vehicle (HTV) successfully blasted off from the island of Tanegashima, south of Japan. This unmanned freighter carries 4.5 tons of equipment and supplies to the International Space Station; its maximum capacity is 6 tons. The 35,000-pound H-2 Transfer Vehicle was tucked inside the H-2B rocket, which also made its maiden flight, for liftoff at 1701:46 GMT (1:01:46 p.m. EDT; 2:01:46 a.m. Friday JST), a rare nighttime launch for Japan. A pair of hydrogen-burning first stage engines ignited a few seconds before liftoff, ramping up to full power before computers commanded four large solid rocket boosters to light. Spewing more than 3 million pounds of thrust, the powerful launcher quickly sped away from Launch Pad No. 2 at the Tanegashima spaceport, flying southeast and piercing an enveloping deck of clouds less than 30 seconds later. The strap-on motors burned out and separated as designed two minutes after liftoff, and the nearly 17-foot diameter widebody first stage completed its job around four minutes later. Here's the idealized version of the H-II Transfer Vehicle mission; watch this HTV video. 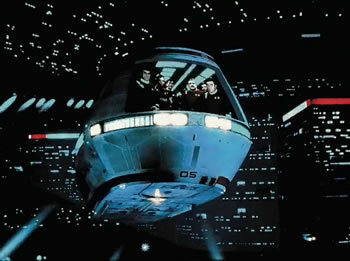 One day, we may get to the point where these mundane transfers of supplies and personnel are routinely carried out by automated ships, like the automated shuttles in Star Trek movies. The idea of a space freighter can be found as early as 1940; see this reference to A.E. van Vogt's space freighter from his 1940 story Vault of Beast.